Our February BIG Call was packed with insights from both the American and Chinese consumers’ perspectives. For the first half of the Call, I presented the latest data from our Monthly Consumer Survey on Confidence, Employment, Practicality, Finances and Savings, and the 90 Day Outlook. Smartphones are big, and tablets are even bigger, primarily due to the countless number of handy dandy apps available for download. From games, planning dinner, tracking the calories in that dinner, to connecting with friends, or even learning How to Drink Your Coffee, there’s bound to be an app for that. With gaming and general entertainment the top two types of apps in both countries, it’s clear that those little Angry Birds have global appeal. 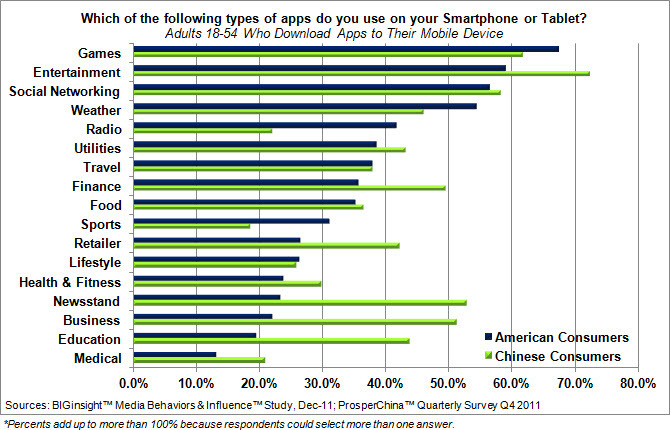 Social networking apps are also popular in both countries, with approximately 6 in 10 Chinese and American consumers connecting with friends and family via their mobile devices. The cultural divide is apparent though once we look past gaming, entertainment, and social media. American consumers are far more likely to download apps related to weather (54.4%), radio (41.7%), and sports (31.0%) than their Chinese counterparts. Mobile-savvy Chinese Consumers, on the other hand, are much more likely to use work-related apps focused on finance (49.4%), news (52.8%), and general business (51.2%). BIGinsight™ ProsperChina™ and Media Behaviors & Influence™ are trademarks of Prosper Business Development Corp.
Can’t get enough of Chinese Consumers? Enjoy some more information on their favorite car brands, how often they shop online and where they shop in person. In Q4 ’10, 40.2% of Chinese Consumers own a car. The top 5 brands driven most often are: Volkswagen (10.6%), Honda (8.0%), Buick (6.5%), Audi (6.3%) and Hyundai (5.5%). Both year-over-year (22.0% Q4 ’10 vs. 27.7% Q4 ’09) and quarter-over-quarter (22.0% Q4 ’10 vs. 26.4% Q3 ’10) the percent of consumers planning to buy a car in the next 6 months has declined. Among those planning to buy/lease in the next 6 months the top 5 brands being considered are: Audi (10.5%), Buick (8.4%), Volkswagen (8.1%), Chevrolet (6.9%) and Honda (6.8%). Carrefour (14.3%) remains #1 for where Chinese Consumers 18-54 shop for groceries most often. Rounding out the top 3 are Walmart (13.6%) and DaRunFa (7.7%) in Q4 ’10. TaoBao.com maintains the lead spot for where consumers shop most often for Apparel/Clothing with 16.7%. Rounding out the top 3 in Q4 ’10 are Parkson (6.4%) and New World (4.2%). In Q4 ’10, Guomei (32.2%) holds the lead for where consumers shop most often for Electronics with Suning second (23.1%). KFC remains in the top spot for fast food restaurant Chinese Consumers 18-54 eat at most often with 31.7% although, this number is down year-over-year (31.7% Q4 ’10 vs. 33.8% Q4 ’09). McDonalds (15.3%) and Pizza Hut (5.8%) complete the top 3. Chinese Consumers pick Starbucks for where they purchase their coffee at most often with 21.1%. KFC comes in second at 16.2% and McDonalds third at 11.7%. When it comes to researching products online, 95.1% of Chinese Consumers 18-54 regularly/occasionally research products online before purchasing them in person or in a store…down year-over-year (97.0% Q4 ’09) and down slightly from last quarter (95.6% Q3 ’10). The top 5 products Chinese Consumers researched online in the last 90 days are: Apparel (52.1%), Electronics (39.4%), Appliances (39.2%), Shoes (34.8%) and Beauty Care & Cosmetics (31.6%). More than 9 in 10 Chinese Consumers 18-54 regularly/occasionally purchase products online, up year-over-year (93.7% Q4 ’10 vs. 92.2% Q4 ’09). Up from Q4 ’09, 83.4% of Chinese Consumers 18-54 regularly/occasionally search the internet on mobile phone devices (vs. 79.3% Q4 ’09). In Q4 2010, purchase intentions for most big dollar durables are down compared to last quarter. House, Major Home Improvement or Repair, Stereo Equipment and DVD/VCR are on the rise. Intent to purchase remains flat for Mobile Device. Here’s your chance to read up on the Chinese consumer: Are the Chinese confident in their own economy? How often do they shop online? What car brands are popular in China? First we will look at the current state of the economy and then dive into the personal financial situation of Chinese consumers. Check back for more on auto purchases, retail and online shopping! 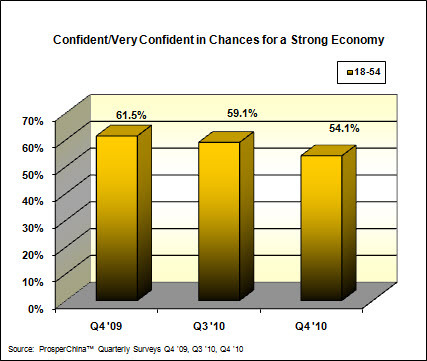 Chinese Consumers’ Confidence in chances for a strong economy during the next 6 months has declined since last quarter (54.1% Q4 ’10 vs. 59.1% Q3 ’10). Confidence remains down year-over-year (54.1% Q4 ’10 vs. 61.5% Q4 ’09). (42.2% Q4 ’10 vs. 44.6% Q4 ’09). Becoming more practical/realistic in purchases had decreased year-over-year (59.2% Q4 ’10 vs. 60.7% Q4 ’09) yet has risen quarter-over-quarter (59.2% Q4 ’10 vs. 56.3% Q3 ’10). quarter (36.4% Q4 ’10 vs. 32.5% Q3 ’10) and year-over-year (36.4% Q4 ’10 vs. 29.7% Q4 ’09). year-over-year (60.0% Q4 ’10 vs. 65.9% Q4 ’09) when more consumers answered they would definitely invest/probably invest. coping methods when dealing with fluctuating gas prices. Year-over-year, Chinese Consumers who say their personal financial situation is “better off” is relatively flat (31.6% Q4 ’10 vs. 31.1% Q4 ’09) and down quarter-over-quarter (31.6% Q4 ’10 vs. 34.9% Q3 ’10). Year-over year, the number of 18-54 year old Chinese consumers that agree/strongly agree with the statement: “I am saving enough to meet my future needs” is on the rise (21.6% Q4 ’10 vs. 19.8% Q4 ’09). However, this reading is down quarter-overquarter (21.6% Q4 ’10 vs. 24.4% Q3 ’10). Q4 ’09) and has decreased quarter-over-quarter (35.3% Q4 ’10 vs. 38.5% Q3 ’10). The card used most often for personal expenditures is bank debit card (33.8%), followed by Visa (28.5%) and Master Card (6.9%), 20.4% do not have a credit card. The top three categories that Chinese Consumers use a credit card for payment are: Electronics/Furniture (41.7%), Clothing (34.2%) and Health & Beauty Aids (29.8%).